Glock 26/27/33 holster with a slightly wrapped muzzle end that still allows the use of threaded barrels. Very small/compact holster that will allow you to carry an extra flush mag, or full-size. Will not fit a Glock 19, etc - as the muzzle end is slightly wrapped. A 1.5" clip is recommended for 1.5" belts or smaller, while a 1.75" clip is needed for larger 1.75" belts. Mid height sweatguard is standard - let us know if you'd like something else here. Please *DO NOT ASK QUESTIONS HERE*, please contact us before ordering if you have any. As a custom, handmade product, any changes, or cancellations will incur a fee. Chances are, we've already started work, and the materials / man hours could become 'throwaway' if you decide to change or cancel. Please be sure of everything before placing an order, and feel free to reach out if you have any questions before ordering. This is a (current) estimated time from the date the order is placed, to the date the order will ship. We're pretty good about this, it isn't a guaranteed ship date - but our best guess at how quick we'll get through the current backlog. Free shipping on anything over $100. These ship USPS with tracking info emailed to you upon shipment. Any other items ordered with a holster will ship with the holster. As long as you don't break it doing something stupid, we'll take care of you. (Leaving it on the dashboard of your car in the summer sun is a no-no as well). All holsters are handmade right here in America (specifically the Rocky Mountains of Colorado), with great pride and care. 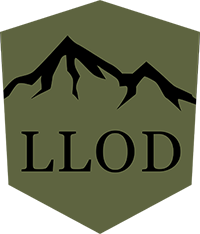 The original "LLOD Holster" is now dubbed "The Associate" because all of the other cool names were taken. It was between this and "The Buddy System", which I kind of might like better - but The Associate is pretty cool too, so we're going for it. This is a purpose-built AIWB (Appendix Inside the WaistBand) holster, designed and developed out of my personal frustration of other manufacturers’ holsters. I designed this to be the most comfortable AIWB holster out there - built for people who carry their gun every day, but don’t want to feel like they’re carrying a shovel in their pants. It’s a single piece holster, so the magazine caddie isn’t removable - which allows it to be as light/minimal as possible and ensuring you always have an extra mag right there. The semi-rigid kydex, one piece design has minimal flex - so your extra magazine isn't flopping around like a wet noodle. It also means the holster isn't 3 feet wide, taking up space along the entire front-side of your body. Even though this is the "V1" it really represents about the 7th iteration of this holster, since conception. Feedback from hundreds of users has led to this specific design. While there isn't a single product that will work for 100% of people - the general feedback is that this is the best appendix carry holster that they've ever owned. The holster features adjustable gun and magazine retention. It is offered with a single, high quality, tuckable clip, which allows it to shift with your body more as you bend and move. The single clip is one of the reasons that this holster is so comfortable leading to a more enjoyable carrying experience. It makes putting the holster on and taking it off a breeze, all while maintaining enough security to run, jump, train, fight (and yeah, even backflip - we have video) in. The whole holster has an extremely ergonomic curve/bend so that it goes with the natural contour of your body and helps it both be more concealable and comfortable than other similar models you may see out there. The curve not only helps with comfort by following the natural curve of your belly, it also uses the bend to help push the grip of the gun to tuck into your body for maximum concealment. 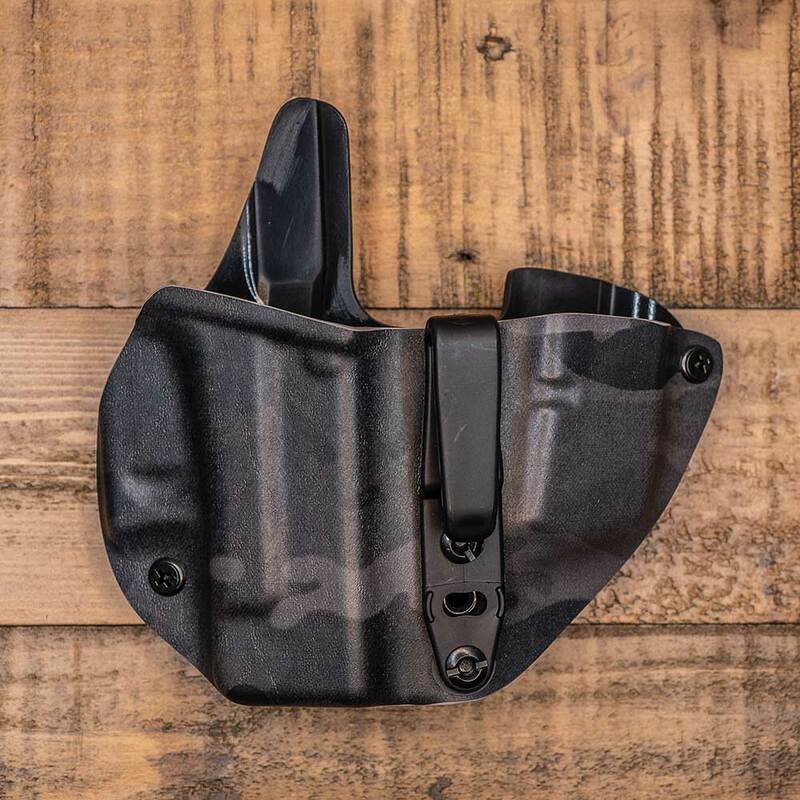 The curve and minimalism also means the holster doesn’t require you to go up 2-4” in pant size like other holsters needing big, bulky claws/hooks/wings to help it be more concealable. All models feature flares at the top edge of the holster to aid in reholstering your gun (much like a flared magwell) and channels for all of the controls for smoother drawing and holstering. What're you waiting for - pick up the holster that will allow you to be your best first and Last Line of Defense.